Toro Lawn Mowers are used worldwide on golf courses, sports fields, public green spaces and commercial as well as residential properties, and agricultural fields. These mowers have been engineered to handle the most difficult of conditions and demanding terrain, without having to sacrifice cut quality or comfort. With a complete range of zero turn mowers, walk power mowers, lawn and garden tractors and hovers mowers there is one for all eventualities. 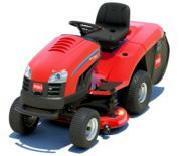 For lush green lawns and neat and tidy cuts the range of Toro Lawn Mowers set new standards. 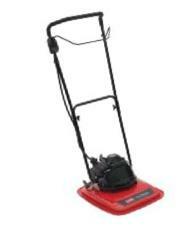 The zero turn lawnmower has been designed with the homeowner in mind. 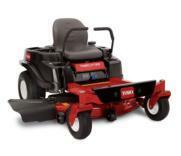 It incorporate easy to use features which enable you to reduce your mowing time significantly. It is powerful and durable for long lasting performance and has unrivalled maneuverability for cutting around trees shrubs. The TITAN Toro Lawn Mowers bring together features very much like those available on the commercial range, being easy to use and comfortable to operate. Of course if your really want to make the smart choice then it must be the TimeCutter Z. It is rugged and tough as well as being agile and smooth, operated by simple to operate levers. It can trim around your trees and flower beds effortlessly. When it comes to walk power mowers you are spoilt for choice. From the Heavy Duty Aluminium Deck Mower, Recycler,super Recyclerand Super Bagger. These mowers include a patented self-propulsion system which results in unmatched quality of cuts. The HoverPro 400 is a compact and lightweight mower and the perfect choice for hard to reach, steep, or slippery slopes where manoeuverability is key. These Toro Lawn Mowers have an exceptionally strong and lightweight ABS injection-moulded deck, better control and greater stability in extreme conditions and difficult cutting areas and a high power-to-weight ratio thanks to weight conscious engineering. These Lawn and garden tractors offer durable and dependable performance and provide high horsepower for easy hauling and towing of attachments, whilst their advanced engine technology makes for easier starts, less noise and vibration. The Rear Engine Rider is a powerful innovative rear mower, that blends proven technology with easy of use. With these lawn tractors you can choose between recycling and rear collection, based on the prevailng conditions. The counter rotating blades create a powerful airflow that easily collect grass clippings and autumn leaves. And a real bonus is that there is no need to get off the tractor to empty the large collector, as it's an easy task to do from the driving seat. The Toro XL series combines contemporary styling with precision engineering, the robust XLS tractor series is designed for customers with large lawns to maintain. The automatic transmission is intuitive to use and transitions seamlessly between forward and reverse. The solid construction, including a cast-iron front axle, will provide dependable service for years, while the large (35 cm) steering wheel and deluxe seat means your comfort is guaranteed. These tractors cut and side discharge clippings, but an optional Recycler system is available for those that prefer to recycle.